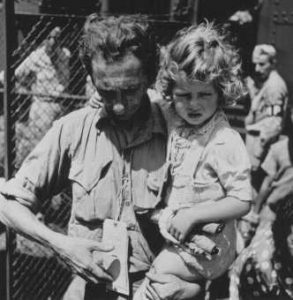 This archive examines America’s history of turning away refugees fleeing from social and political turmoil, with a specific focus on Jewish refugees during the World War II period. Especially relevant in today’s unstable global political climate, it is important to discuss America’s tendency of rejecting citizens of other countries escaping genocide and persecution. Although this archive will examine only one example of negligence, it is important to acknowledge that this example and other precedents of this behavior is still seen today on a national scale. Therefore, it is crucial to bring these issues to the forefront in order to spread awareness and facilitate change to help those whose voices and cries for help cannot always be heard. In the works that I have gathered, I begin by outlining the rise, and eventual power, of Adolf Hitler, and the anti-Semitic rhetoric that was the backbone of his rule. 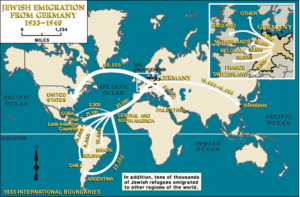 I then navigate through the voyages and destinations of the refugees, looking at their travels and how the American government decided to react to the crisis. 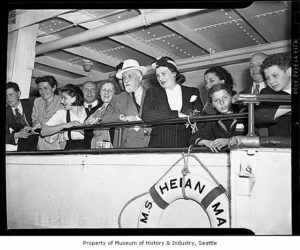 Through photo galleries, maps, personal narratives, and legal documents, some from within the DPLA, and others from external sources, the struggle and history of America’s reception of Jewish refugees is discussed and analyzed through a different visual perspective. 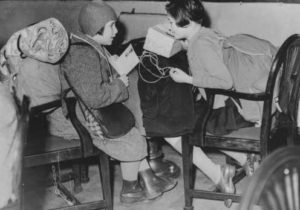 The DPLA offered an abundant amount of content regarding Jewish refugees, however, it was difficult to find content that was specifically related to WWII. Therefore, I branched out to other sources, mainly the United States Holocaust Memorial Museum Photo Archive, to find images of what I was trying to convey in my own archive. The items I selected for my archive were chosen on the basis of whether or not they fit in the time frame I was observing (between 1933 and 1945), and if the image or item would add something constructive to my analysis. For example, an extremely long and elaborate legal document would not serve as an effective item in my archive, as it would only complicate the user experience. A condensed version of this legal document, or selecting an excerpt from it would be a more productive item. As far as user interaction, it is especially important when looking through this archive to do so in a sequential matter, adhering to the order in which the content is displayed. Clicking on images will give the user more information about the context and source of the image, and other information that came with the content. If an image is small on the main archive page, clicking it can also enlarge it, making it easier to look at. Videos are already embedded in the page, so clicking the ‘Play’ button is all that needs to be done to view it. As shown by this timeline, anti-semitism was one of the few aspects of Nazi Germany that remained strong from the beginning of Hitler's rise, all the way to the end of his reign of power. I decided that the best way to showcase this consistency was by tracking the start of the anti-semitism that first appears in Hitler's book, Mein Kampf, all the way through the start of the way, represented by images of Nazi, anti-Jewish propaganda. 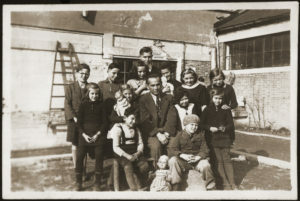 Most of these images come from the United States Holocaust Memorial Museum Photo Archive. Luckily, there were no metadata restrictions for this timeline, as I was able to manually put in the year for each of these items based on the information the Photo Archive gave me. 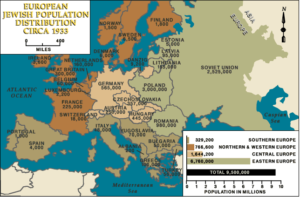 As can be seen with the two maps to the right, Europe garnered an immense Jewish population, and only so many were able to escape. I found these two images to be useful to the archive, as they were able to add a new element to the refugee crisis during WWII, one that went beyond images of the refugees themselves. They, along with the Congressional legal document above, provided new insight about the development and consequences of actions during the war. 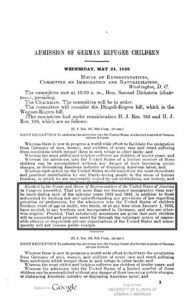 The legal decision made by Congress perhaps encouraged some of the widespread evacuation of the Jewish community, as shown by the maps, which is why I decided to put them together in the archive. I decided to include a video in my archive because I felt that it would add a more personal and emotional tone to my analysis. 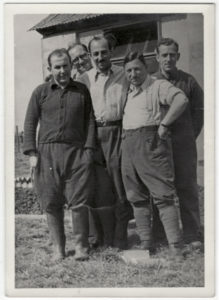 Taken from the BBC, here is a Jewish refugee who recounts his experiences during the war and how he and his family eventually achieved safe haven in England. Images can contribute a lot to an archive, an a picture can represent a thousand words, but I felt like there needed to be at least one personal narrative in this archive in order to reach a certain level of realness, and as a way to further engage and connect with the you, the audience. Passengers aboard the St. Louis. 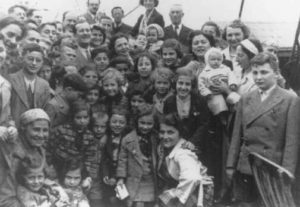 Jewish refugees aboard the refugee ship St. Louis. 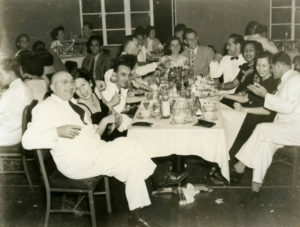 After being rejected from both the United States and Cuba, the ship was sent back to Europe, with almost all original passengers, most of which Jewish refugees, still on board. The motor ship, named ‘Heian Maru’ of the Nippon Yusen Kaisya Line docked at the Great Northern Dock from Japan. Found in the DPLA. Staff PhotographerSeattle Post-Intelligencer. 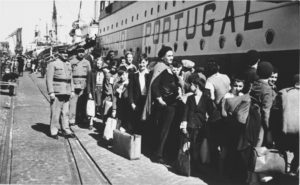 Two uniformed Portuguese policemen stand on the pier in the port of Lisbon as a group of Jewish refugee children wait in line to board the SS Mouzinho. 1941 August 20. United States Holocaust Memorial Museum, courtesy of Milton Koch. 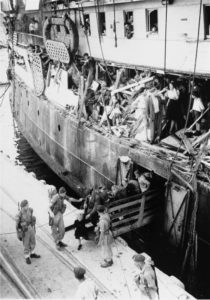 Jewish refugees board the SS Mouzinho for the voyage to the United States. 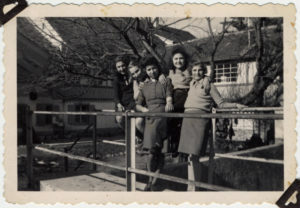 A group of Jewish refugees wait behind a wooden fence in the port of Lisbon before boarding the SS Mouzinho. 1941 June 10. United States Holocaust Memorial Museum, courtesy of Milton Koch. In addition to discussing the history and American action, I knew I also wanted to give specific examples of refugee journeys that transpired during the war. I wanted to make sure I would be able to display each voyage in a concise and organizational way, while still being informative. Consequently, I decided that dividing a single row into three sections and placing an example in each one would be both effective (as far as conveying information) and aesthetically pleasing for the audience. Even though most of these images have been extracted from the DPLA, those that are not are given ample context in order for the audience to understand and connect the images to others in the gallery. 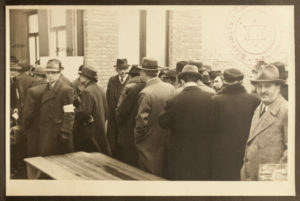 Jewish refugees from Europe arrive at the emergency refugee shelter at Fort Ontario. A father, holding his daughter, checks his tags. Oswego, New York, United States, August 4, 1944. — National Archives and Records Administration, College Park, Md. As a final piece for my archive, I wanted to end on a positive note, listing some of the many places around the world that agreed to take in Jewish refugees, saving them from inevitable extermination. Instead of just bullet-pointing locations, I decided to find images of refugee camps from some of these locations and display them in a tile gallery. This way, the audience can observe the images, while being able to tell where the refugees were by simple mousing over the image. Of course, more information about the context and source of the images is available if the user clicks on it, but the simple format of the main archive page is exactly how I wanted to showcase the materials I found. Overall, searching and finding the items that are featured in this archive was both an educational and saddening experience. I learned much more about the refugee crisis during the war and how other countries, aside from the United States, dealt with it. However, it was also frustrating learning about all the ships, families, and children who were turned away in their most desperate time, for a political or social reason I, along with many, still cannot understand. Refugee crises occur all too often in this world, and not enough action is done to aid and stand up for the victims of human rights violations. The most significant message I want to convey through this archive is the power of conversation. And more importantly, the preventative actions that can be a result of that conversation. United States Holocaust Memorial Museum, United States Holocaust Memorial Museum, www.ushmm.org/collections/the-museums-collections/about/photo-archives. “U.S. Policy During the Holocaust.” The Tragedy of S.S. St. Louis, www.jewishvirtuallibrary.org/the-tragedy-of-s-s-st-louis. “The Jewish Refugees the US Turned Away.” BBC News, BBC, www.bbc.com/news/av/magazine-39857056/the-jewish-refugees-the-us-turned-away. Special thanks to the United States Holocaust Memorial Museum for being so kind as to allow me to freely use from their Photo Archive. This archive would not be what it is without all their incredible and informative content. ―This archival exhibit was created by Giselle Briand in Literature and Digital Diversity, fall 2017.